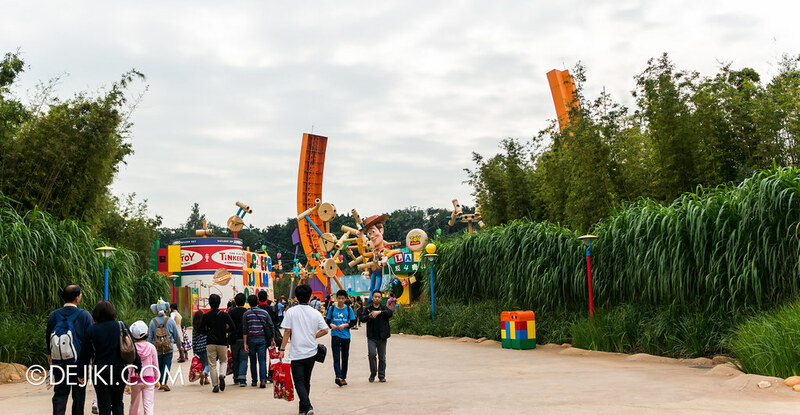 Toy Story Land is not exclusive to Hong Kong Disneyland, and is the second in the world to be built. 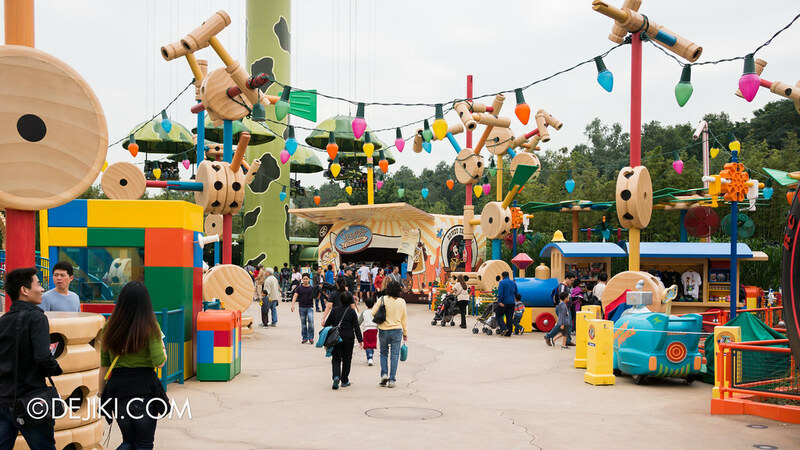 The first one was built at Walt Disney Studios (Disneyland Paris Resort) and called Toy Story Playland. 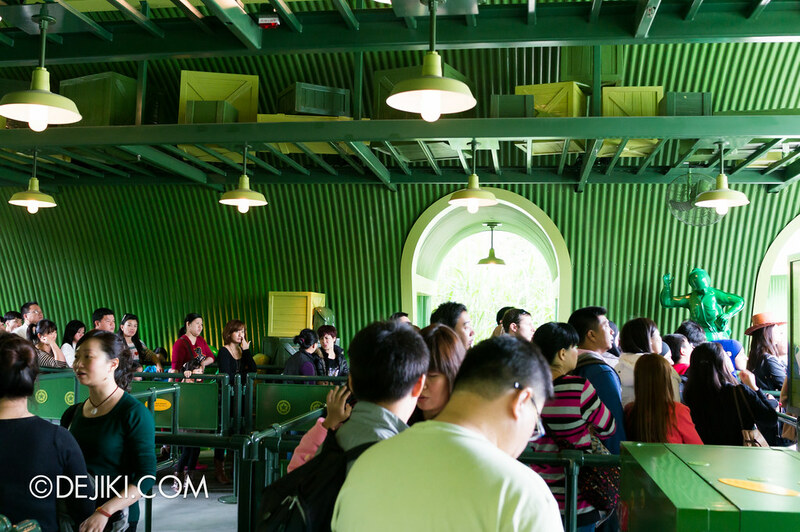 While it has a different layout and theming, it has the same three attractions as Hong Kong. 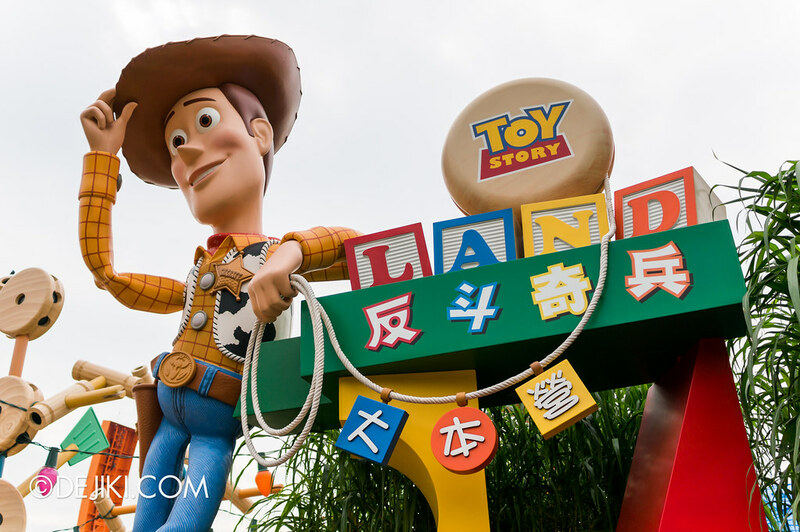 Toy Story Land will also be built at Shanghai Disneyland. 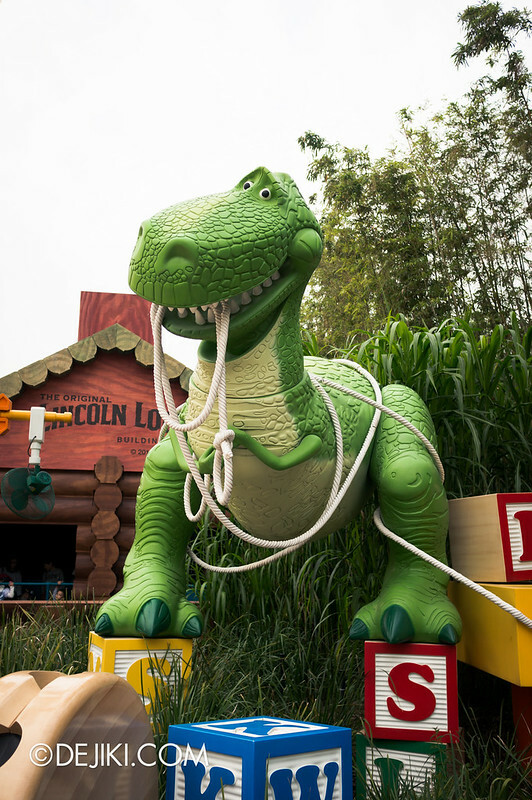 Rex faces Mystic Point, and he is excited about new toys (guests) walking into Toy Story Land. Woody stands tall at the other entrance (connected to Fantasyland). Both characters do not move, but do speak their signature lines from the film series. 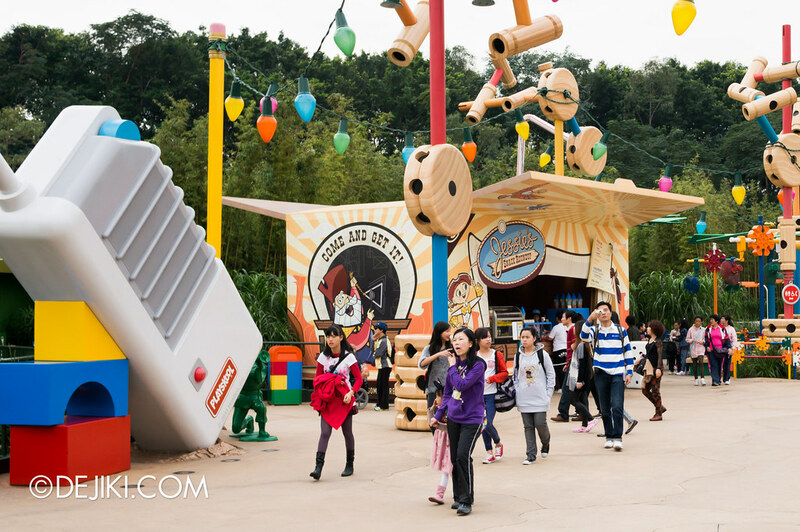 The theming at Toy Story Land is quite incredible. Various design elements create the illusion of a backyard play area. There are a lot of giant and nostalgic toys scattered – untidily – all over the place. 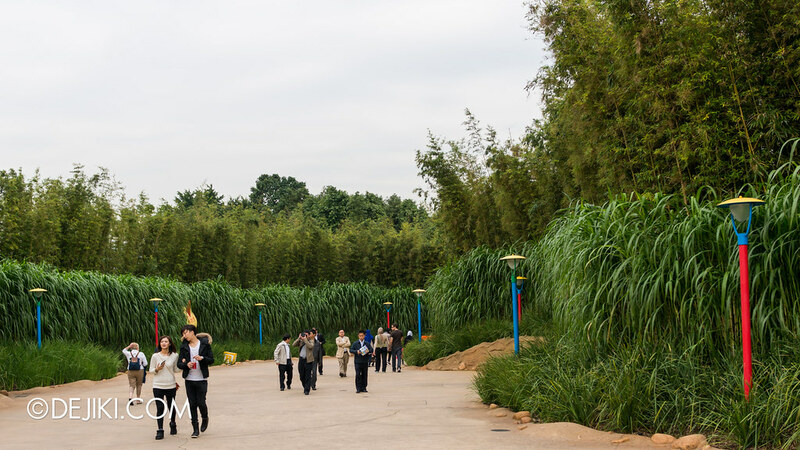 Tall walls of bamboo circle around the area, making guests feel small(er). Buildings are created with scaled-up toys, packaging boxes and “construction toys”. They are the “real deal”, with design and elements licensed from toy makers (Mattel, Hasbro, etc). There are also giant shoeprints, presumably Andy’s, on the ground. 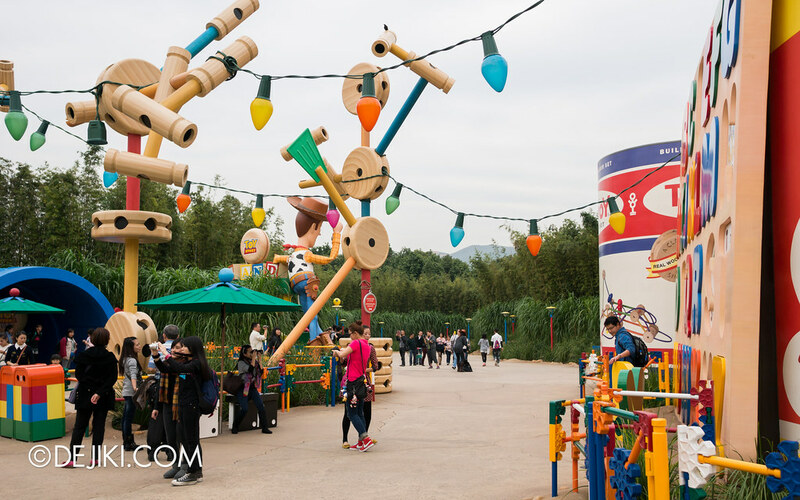 And instead of street lamps, Toy Story Land has several branches of Tinkertoy (those wooden drums and sticks) and chains of giant colorful lights. Be sure to check the next entry for night-time photos! As guests at the park love taking photos, there are ample opportunities tucked at every corner. 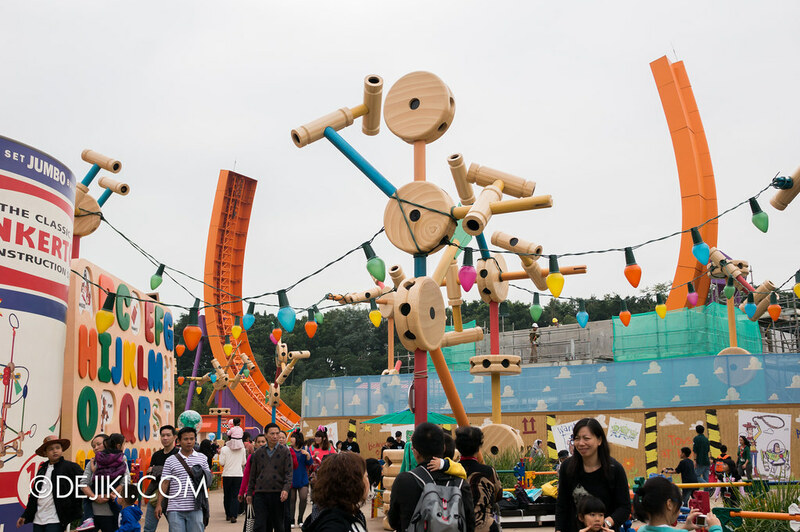 At the entrance of each ride’s queue is a photo spot, and there are several toys lying all over the place, and “roaming toys”. My Sister and I love frozen yoghurt from theme parks. 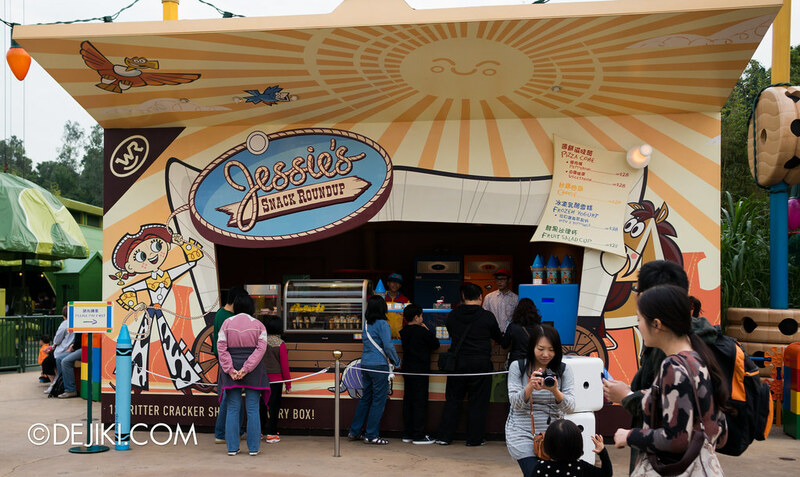 We just had to buy froyo from Jessie’s Snack Roundup. You get a nice big cup for HKD38 (two toppings). The cup is pretty cute but we forgot to keep it! 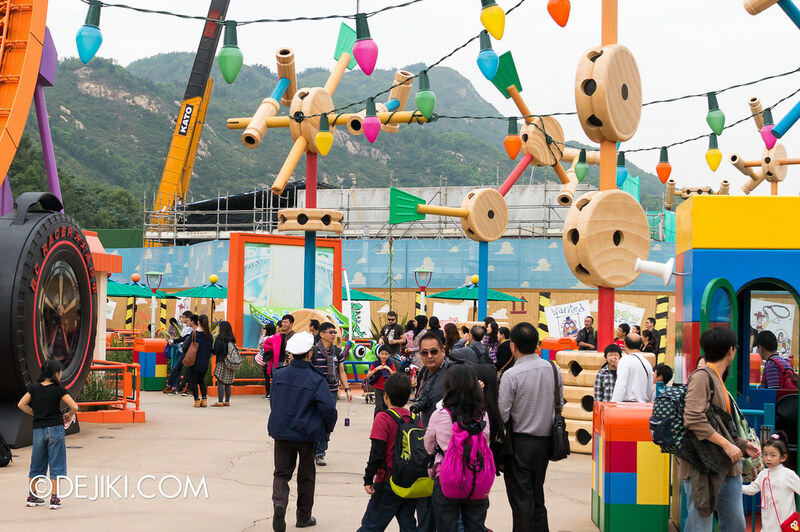 The Tinkertoy works extraordinarily well theming Toy Story Land. Over here we can see green pieces forming a sheltered area. 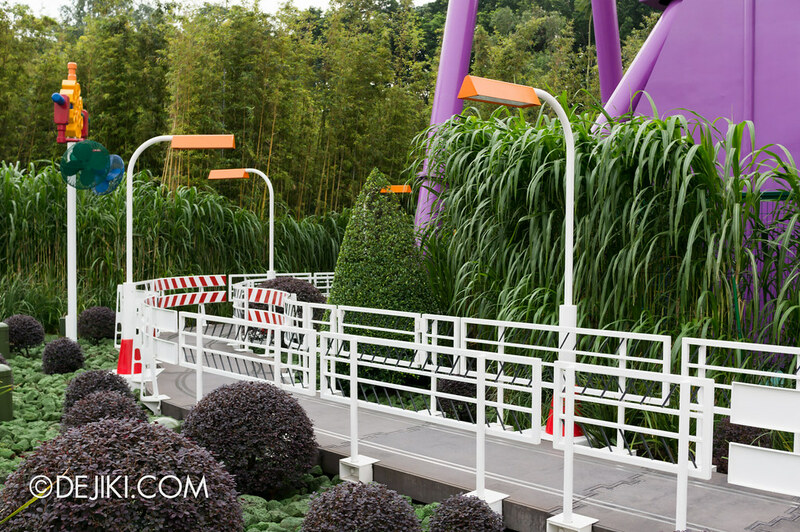 They are also used to place speakers and lighting (even status lights for one ride), eliminating any awkward structures which would ruin the theming. 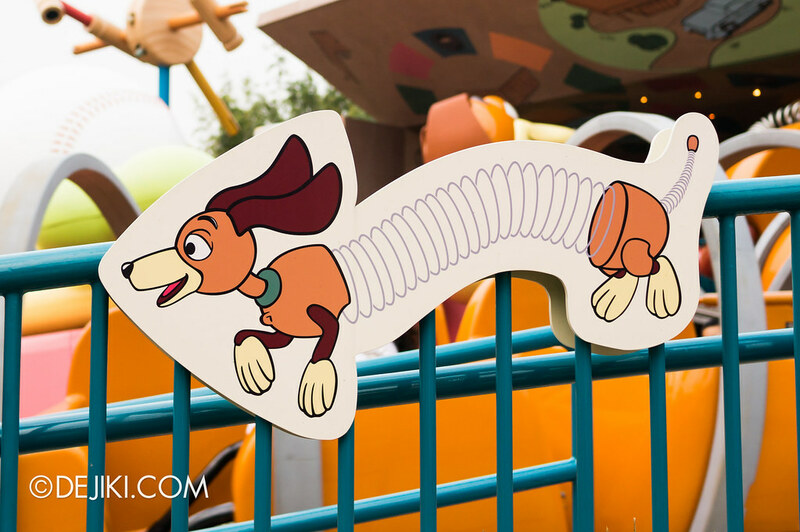 The most kid friendly of the lot is Slinky Dog Spin. This is similar to Music Express rides at travelling carnivals, but is closer to Caterpillar rides due to its gentler changes in elevation. 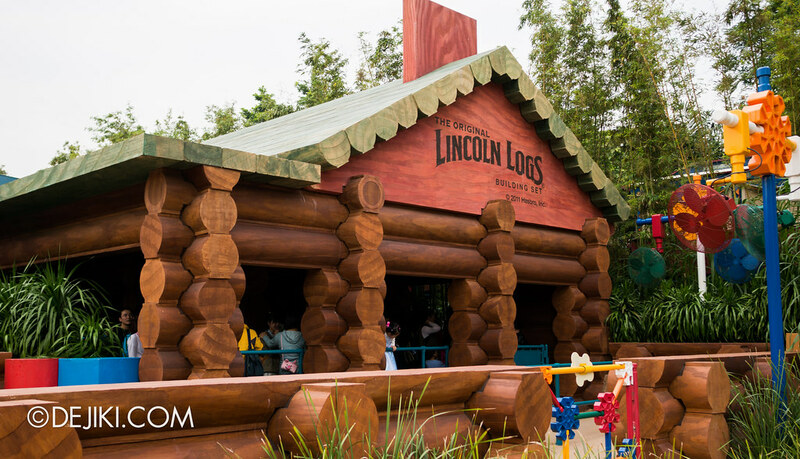 Queues start outdoors, with a few character cards (Woody Photo-op here) and leads into the house made out of Lincoln Logs. 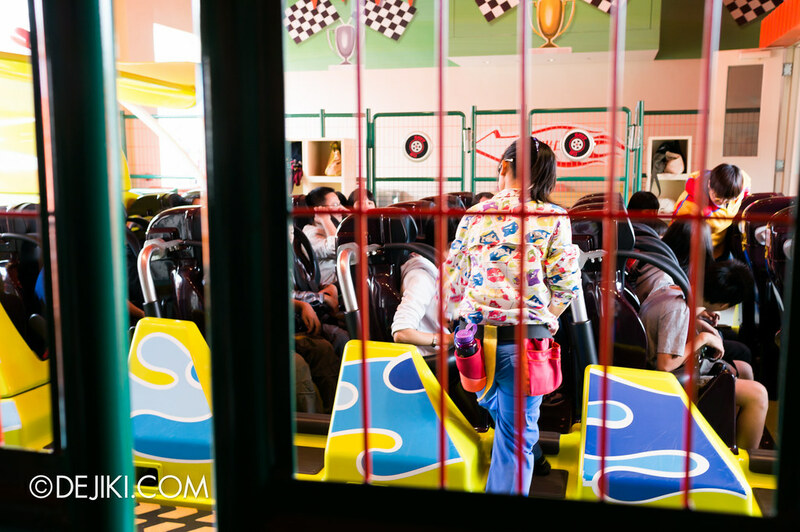 Like similar rides, the smaller (or lighter) guests should always enter first and sit closer to the center. 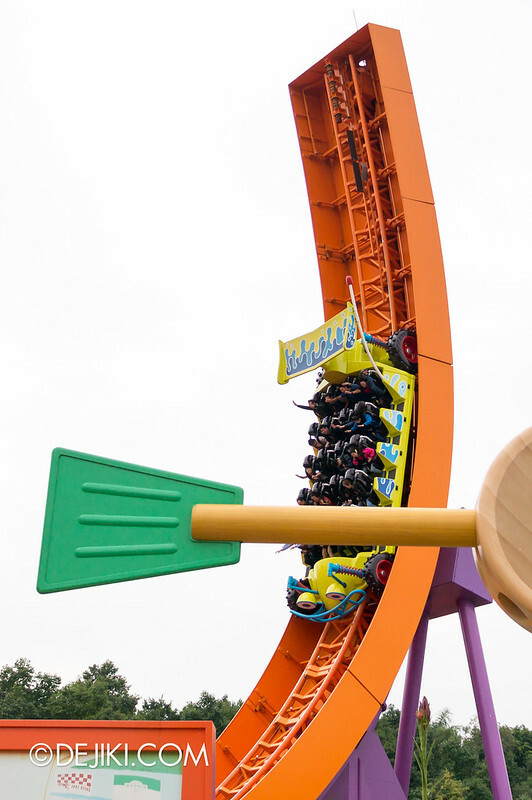 It’s not really a big issue here because the ride does not spin fast enough to create strong forces. 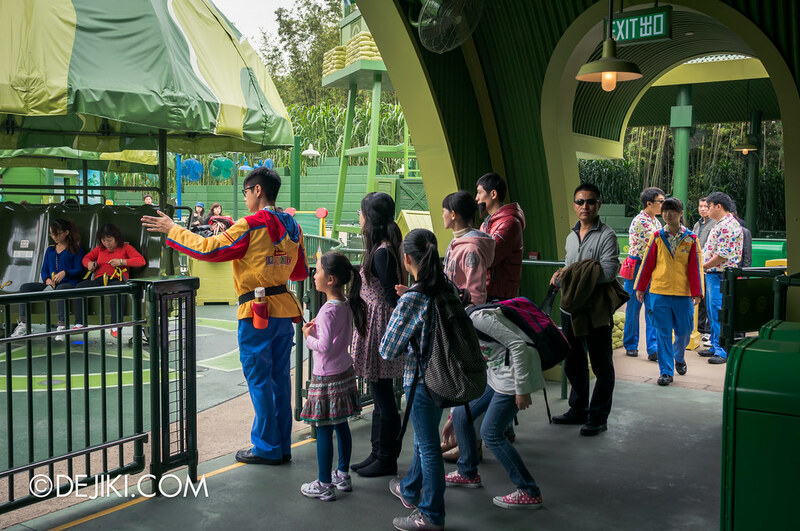 Just like the other “flat rides” in the park, passes are used to quickly manage guests waiting in line. Essentially Slinky is running in a circle, chasing his tail, while guests are inside the coil. It’s a very gentle, relaxing ride and despite how “kiddy” it is, I’m shocked that the line was over an hour in the afternoon. As the name suggests, this is a drop ride. While not as fast or tall as most drop towers, it’s another fun experience that provides a nice aerial view of Toy Story Land (plus Mystic Point and Adventureland, if you are facing those zones). The drops could be surprising for some guests, but shouldn’t be too uncomfortable. 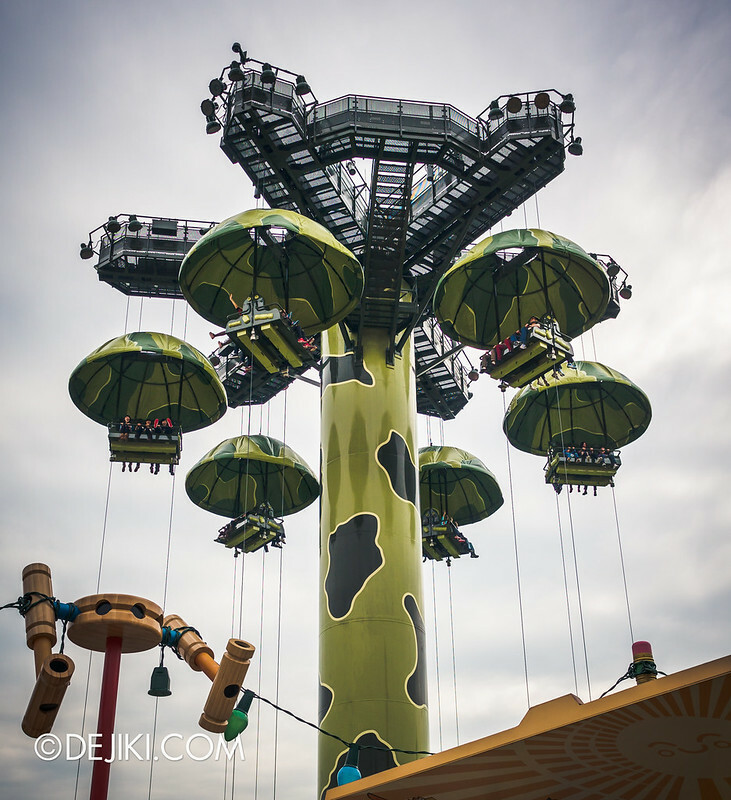 Ride vehicles would be raised to the top and descend gently (from a height of 25 metres) for a few times. 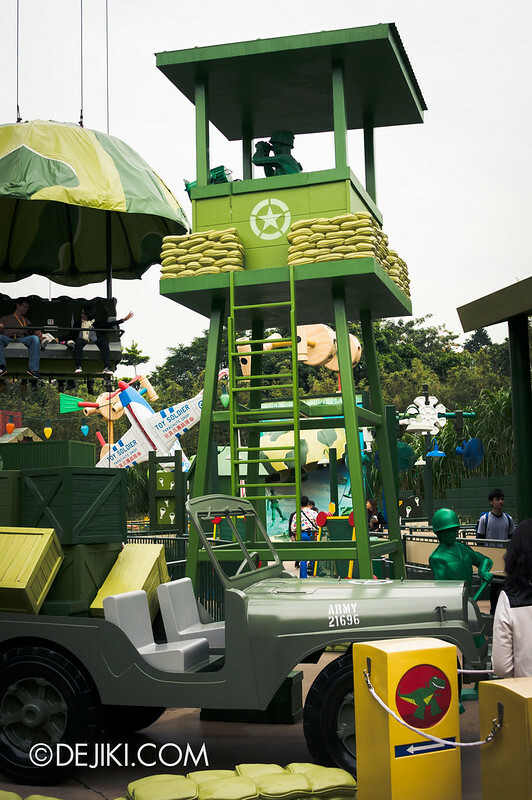 Guests enter the toy solders’ territory: Fort Emery where several toy soldiers can be seen working. The hangar building has a number of props lying around. This ride has a low capacity because it can only seat up to 36 per session. There are six vehicles with six seats (3 on each side). There’s a bit of a wait after being seated due to safety checks. Single Rider could be a real time-saver here. 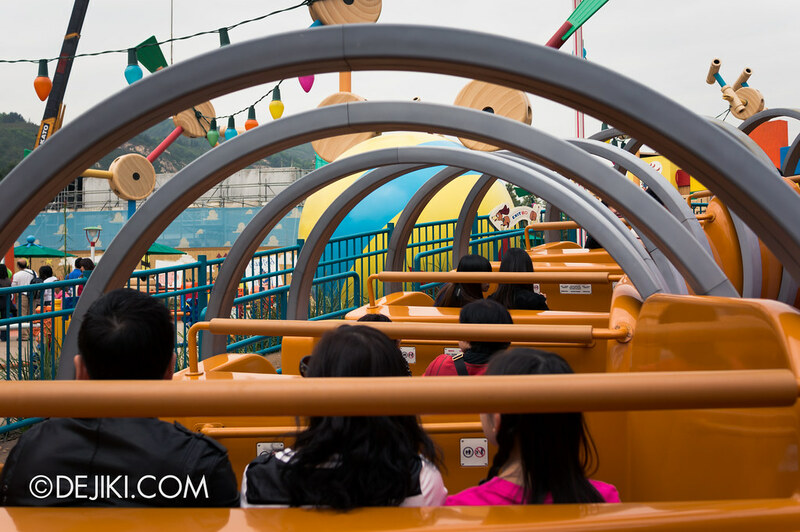 While each side of the ride vehicle seats three, most guests visiting the park are in pairs (or larger even-numbered groups). There is always a need for single riders. 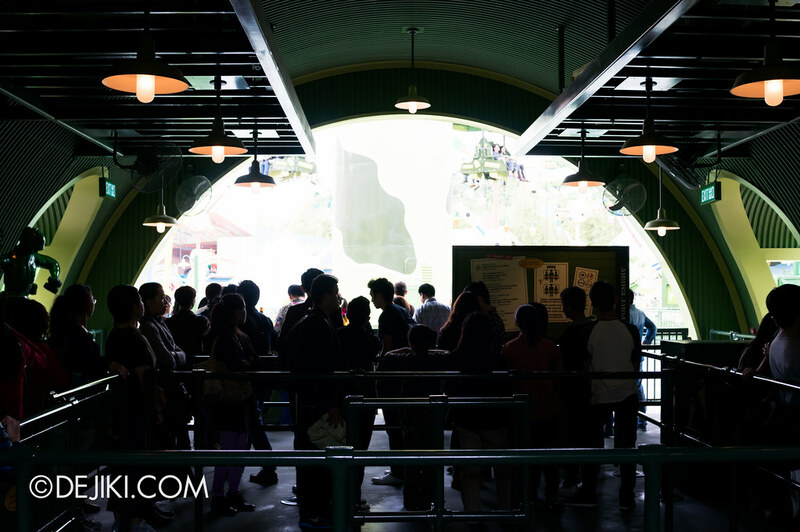 What’s nice here is that the cast members have a neat tool (a simple flipbook, actually) to count the number of leftover seats, allowing the empty seats to be quickly filled with single riders. 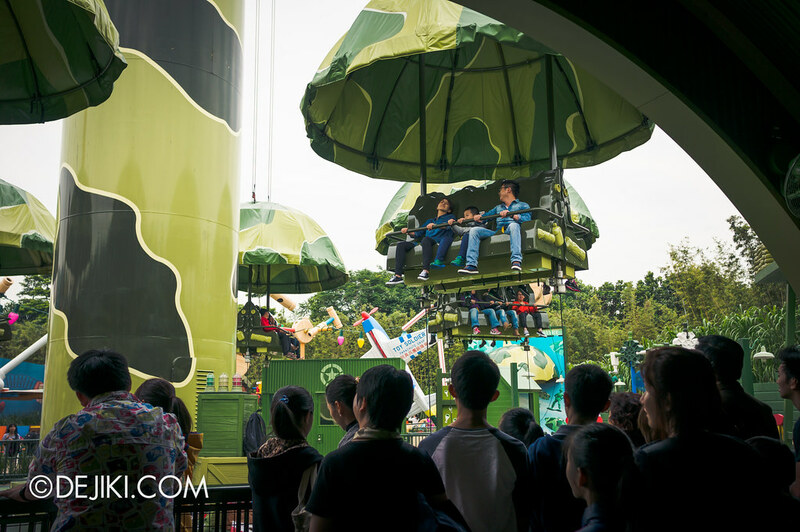 Guests are not allowed to bring any loose items onto the ride. There are numerous crates at ground level for guests to stow their belongings. 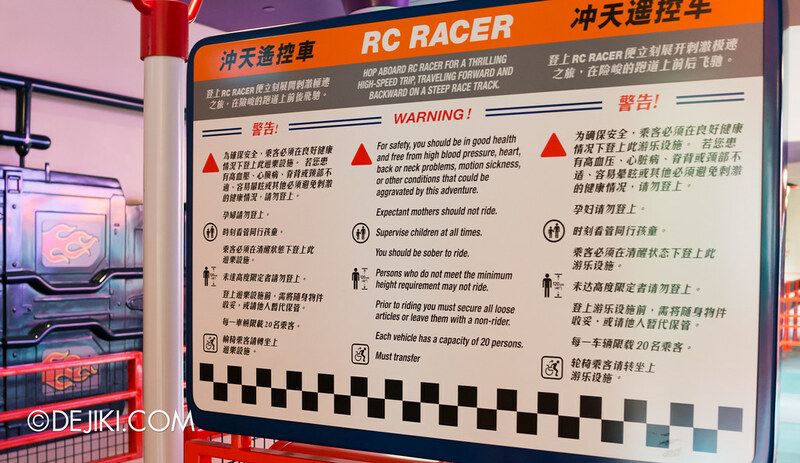 Adults and brave children would enjoy RC Racer. It’s a shuttle rollercoaster that goes up and down a half-pipe track. This is built by Intamin and uses a magnetic launch and braking system. Needless to say, the G-forces are strong here. Regrettably, I was rushing around the park and forgot to take a photo of RC Racer in action. Here’s a poor photograph of the ride vehicle, blocked with a Tinkertoy. The queue for RC Racer is quite interesting. It starts off with a race track section. Look closely, and you’ll spot the subtle detail here. 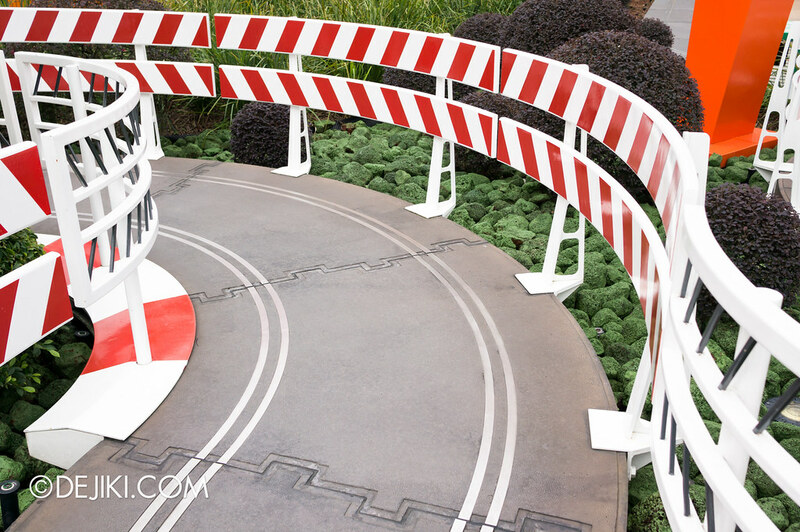 It’s not just any ordinary path, but designed to look like those “snap-in-place” toy race tracks. The indoor queue is like any of those Hot Wheels toy buildings. 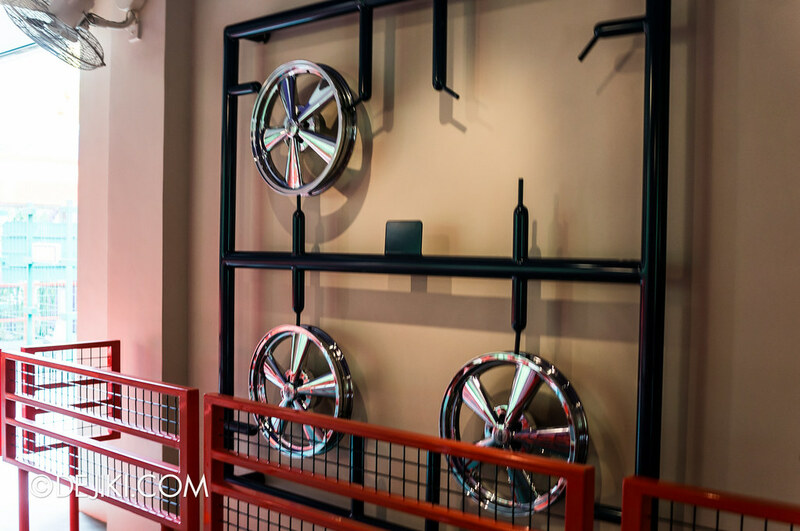 There are race car pieces on the walls. These pop-out pieces are so common with toys from long ago, you know, back when you had to assemble them. The first row offers the best view and it’s worth the extra wait. I was fortunate to be offered that row when some kids were too afraid and requested to swap. 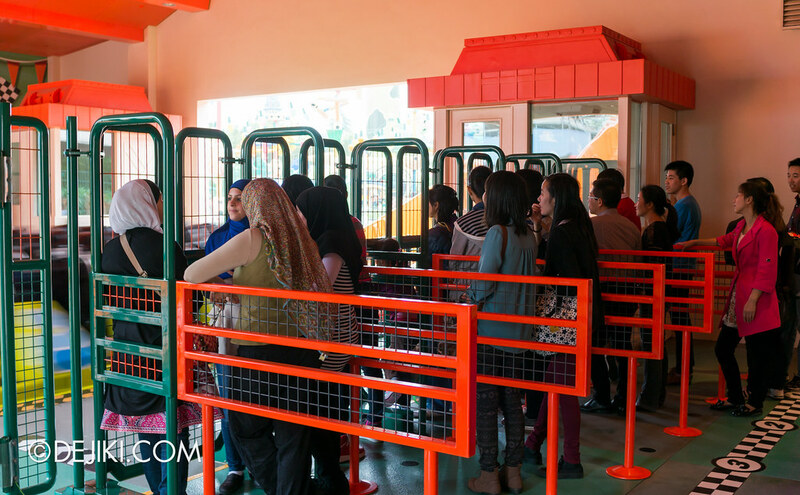 Guests are not allowed to bring any loose items onto the ride. There are shelves at the unloading section to store bags and items. 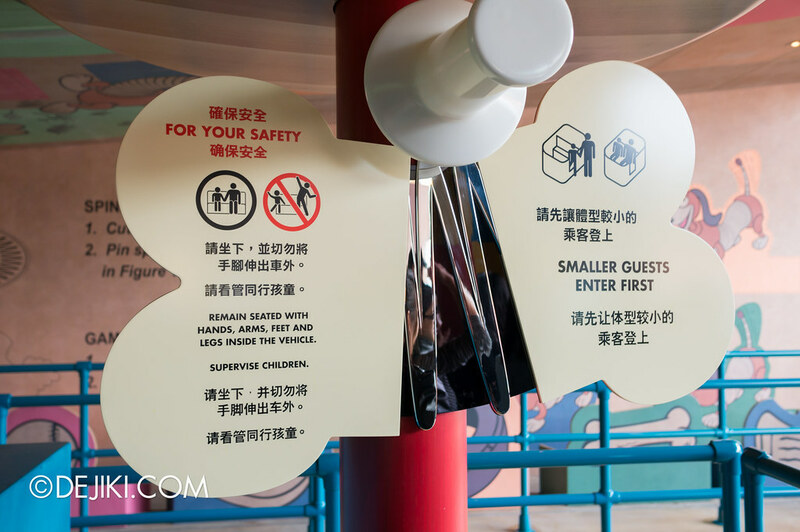 Unlike the RC Racer in Walt Disney Studios (Paris), the Hong Kong ride vehicle does not have any pockets for small loose items. The ride duration is quite short. It starts with a bustling countdown. RC warms up and gains speed after a few cycles. If I remember correctly, it only reaches peak height (at both ends) twice before slowing down. RC Racer uses over-the-shoulder restraints. They are quite comfortable. The restraints are also secured with a seatbelt in case the restraints are released while the vehicle is in motion. Interestingly, this seatbelt element is electronically locked for extra safety. They cannot be released until the ride vehicle has completely stopped. I’m not sure if it’s an Intamin thing, because so far the rollercoasters I’ve been on that uses the seatbelt safety mechanism are manufactured by Vekoma and Bolliger & Mabillard. On those rollercoasters, the seatbelt buckle may be released any time during the ride. Over in the background, Andy’s Toy Box is under construction. This will be a retail store for Toy Story Land. 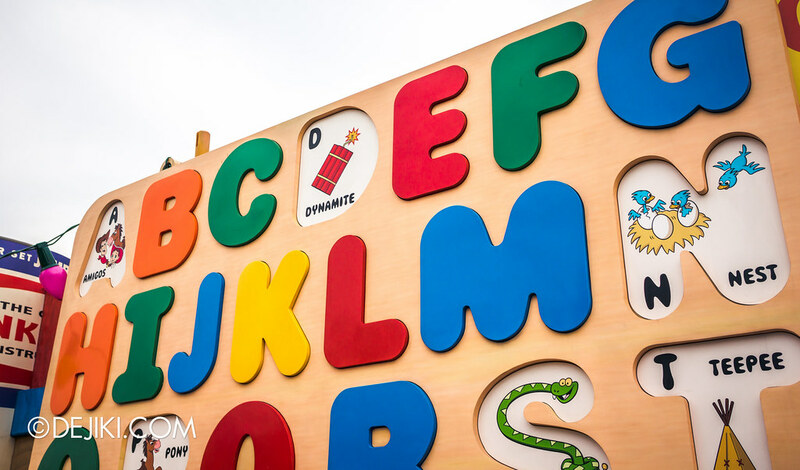 A colorful alphabet toy, where some letters are taken away (to form “ANDY”) at the bottom, not shown in this shot. The letters P, S and T are missing. 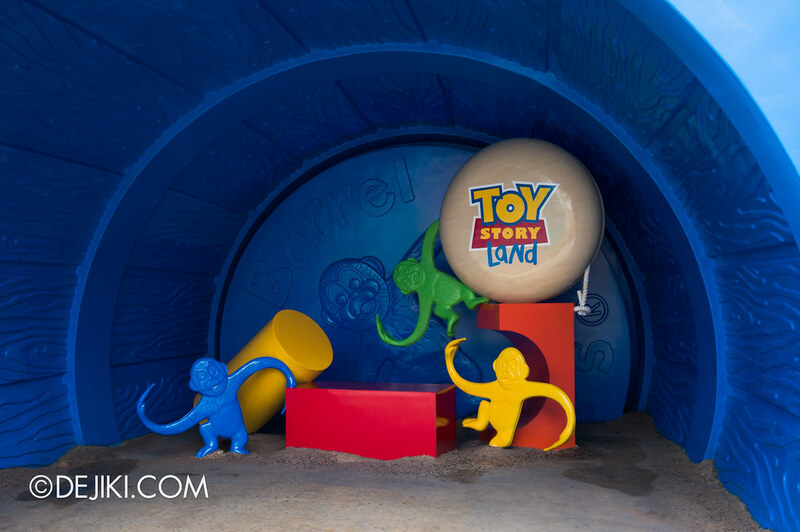 One possibility: Toy Story Playland. Assuming it was supposed to share the same name as the one in Walt Disney Studios (Paris). There is a Barrel of Monkeys tucked at a corner. This is a Meet and Greet area for park characters, such as Woody. 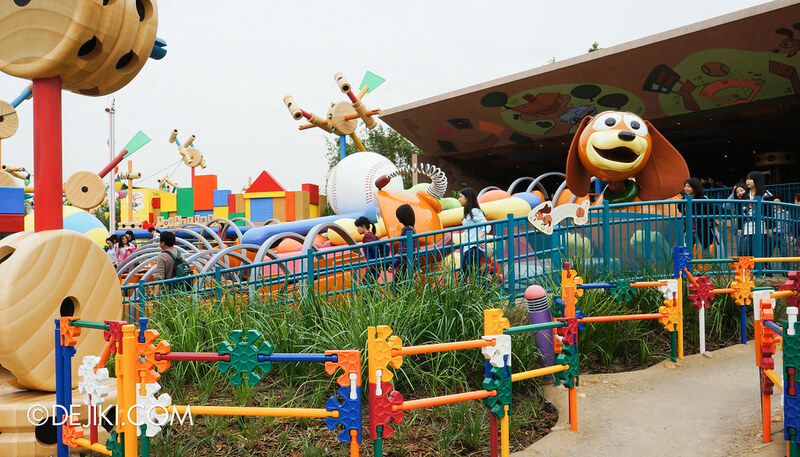 View of Toy Story Land from Fantasyland. 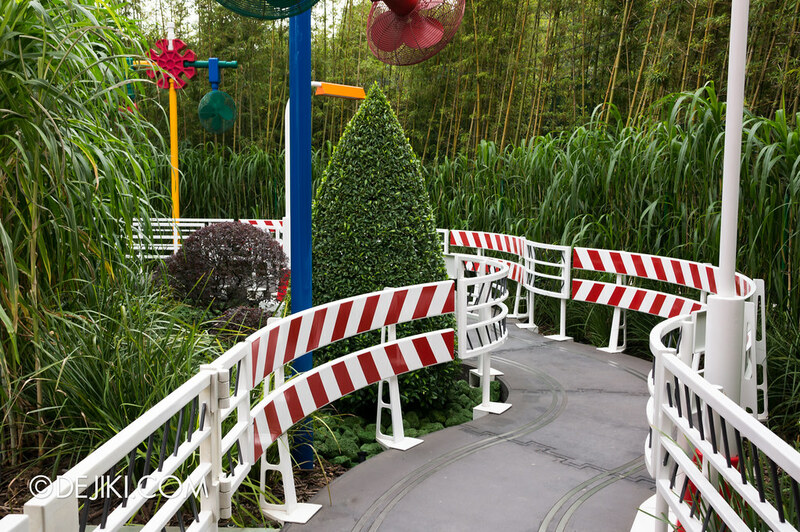 And view of the pathway from Toy Story Land. It’s a bit of a walk, but the distance helps with the gradual transition in size. 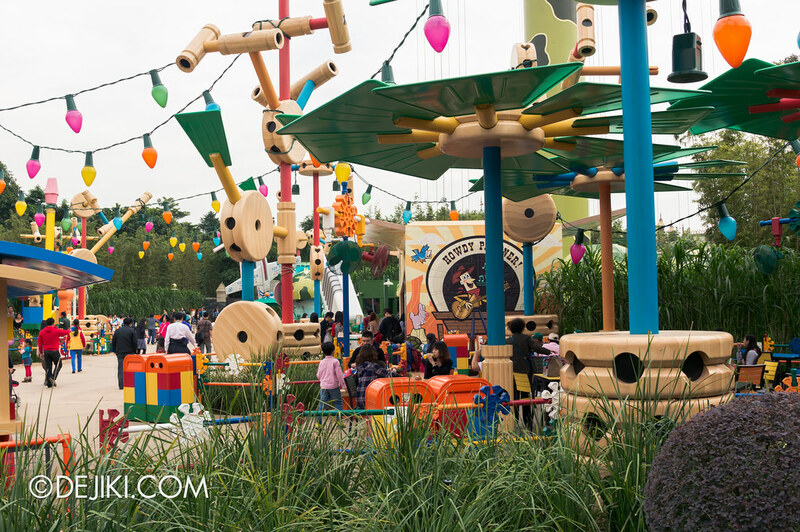 I think that the park designers wanted the toys to look tiny from afar, and slowly become “bigger” as guests walk towards them. 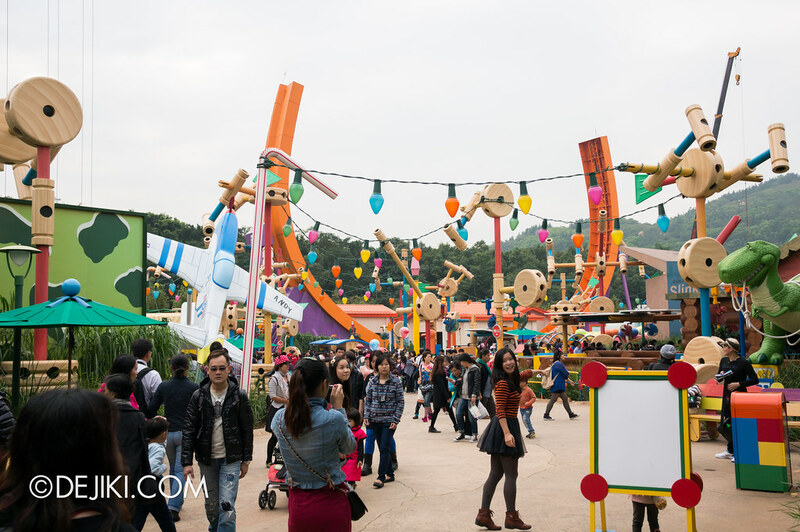 A rumour claims that Toy Story Midway Mania (an interactive dark ride) may be eventually built at this area, making Hong Kong Disneyland the only park in the world to have the “complete set” of Toy Story attractions. The park already has Buzz Lightyear Astroblasters, also another interactive dark ride, at Tomorrowland. 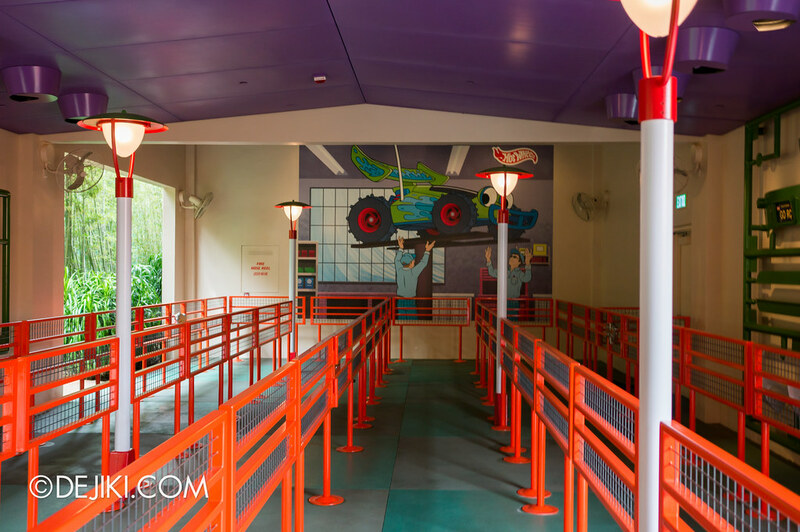 Toy Story Midway Mania is currently operating at Disney’s Hollywood Studios, Disney California Adventure and Tokyo DisneySea. 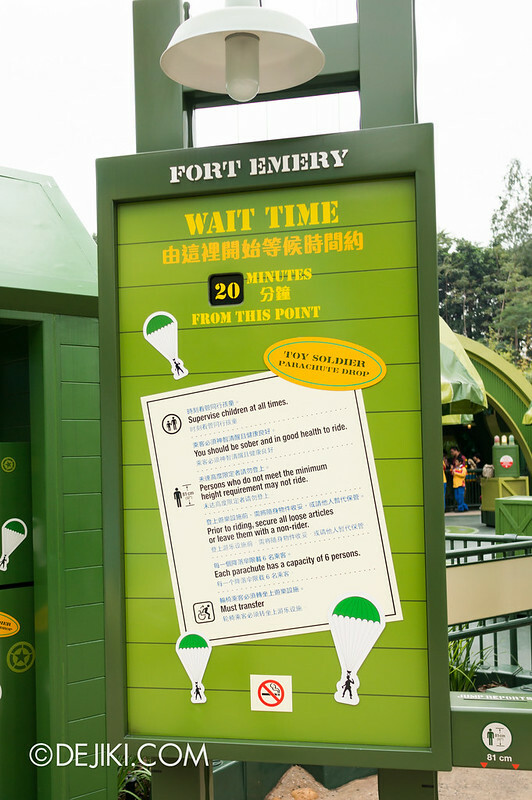 There is sufficient space backstage at Hong Kong Disneyland, in between Toy Story Land and Fantasyland, for this to happen. TSPL is an abomination. Hate the place in Paris, and this one looks just as bad. I really do not like it at all.